Delta Dental of Arizona, through its Foundation, proudly announces a $1 million gift to the St. Vincent de Paul Dental Clinic helping to ensure both preventive and emergency oral health care for underserved children and adults for the next 10 years. The historic gift, presented this morning at the annual St. Vincent de Paul Community Fundraising breakfast, exemplifies Delta Dental of Arizona’s mission to improve the lives of Arizonans by promoting optimal oral health. 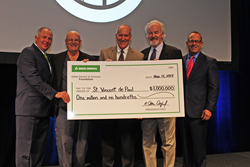 “We trust, and know, St. Vincent de Paul will execute our vision to provide improved oral health for Arizonans and are pleased to be able to participate in the delivery of additional quality dental care to more patients in need,” said Delta Dental of Arizona President and CEO Allan Allford. Last year, SVdP embarked on a capital campaign to double the size of the dental clinic to better serve the needs of their clients. By 2019, the dental clinic will expand to 18 chairs and provide dental services to over 10,000 patients a year. The $1 million gift will be used to help sustain the operations of the dental clinic through 2027, and the clinic will be renamed the Delta Dental Oral Health Center.